Preschool Rugs make great teaching aids! Preschool teachers can use all of the teaching aids that they can get their hands on. Rambunctious children gathered together in one room can make it virtually impossible for you to deliver your daily lessons. 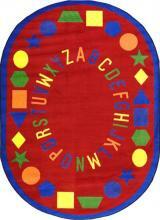 Our preschool rugs engage young children in the learning process. We designed these rugs to help preschool students phonetically sound the alphabet and identify the myriad shapes we have printed into the rugs. Your students will be able to form simple words and understand the difference between a square and a circle after spending some time on the Preschool Rugs. Glue down the Preschool Rugs for easy installation. We offer eight different sizes, four each in round and oval shapes. Our proprietary SoftFlex® support allows your students to learn in comfort. The tightly woven material does not wrinkle and it protects your students from extremely hot or cold classroom floors. We construct the Preschool Rugs with Colorfast, which is an anti-fade agent that ensures you will enjoy your Preschool Rugs for years to come. We treat every rug with an antimicrobial compound to prevent the growth of mold and mildew. Our rugs exceed stringent federal indoor air quality standards.